I got the Lark for Bonita, from the orginal owner, for our anniversary in 1995. It was very well maintained as the original owner was the mechanic for the local newspaper's fleet of trucks. It has the V8 motor in it. The interior had been partially replaced with similar material. He bought the car new from Cherokee Motors here in Knoxville, Tn. in May 1962. Evidently the convertibles stayed on the showroom floor for several months before the dealer would let it go, usually until they got another one to take its place. After buying it, we re-painted it the correct color and installed the correct upholstery. We have upgraded it to disc brakes & rebuilt the engine a few years ago. It's having some transmission repairs done this fall. Bonita drives the car from April to November (if it's warm enough for her). She loves cruising around with the top down. For 1959 and 1960, Larks were available with either an L-head (flathead) 170 cu in (2.8 L) six-cylinder engine or the company's 259 cu in (4.2 L) V8. Testers at the time gave high marks to the V-8's performance. A V-8 Lark could turn out a 0 to 60 mph time of around 10 seconds, which was on par with much larger cars. 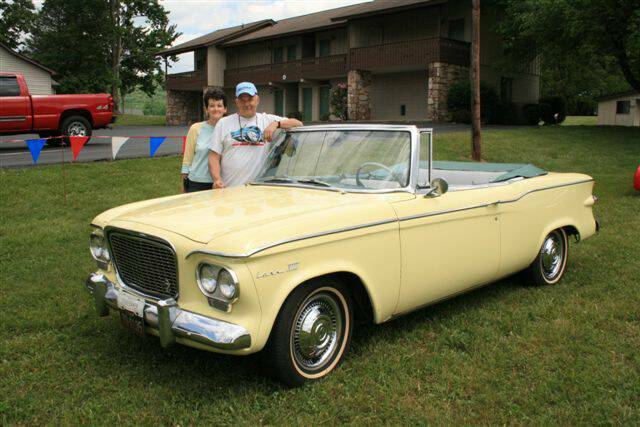 By comparison, among the early Big Three compacts (Ford Falcon, Mercury Comet, Chevrolet Corvair and Plymouth Valiant) that arrived on the scene in 1960, only the Valiant could break the 20-second mark from 0-60 mph. None of the Big Three compacts offered a V-8 until the second wave of such cars — the so-called "senior compacts" — arrived for 1961.